on the PRO ORGANO label. Pro Organo / Zarex Corp.
Frederick Hohman presents a program of standard concert organ repertoire - including a major prelude and fugue of J. S. Bach, and music by composers in the French Romantic and Post-Impressionist schools, upon the new 4-manual Reuter organ at the Cathedral of the Immaculate Conception, Springfield, Illinois. Recorded in late May, 2017, the album was released in September 2017. 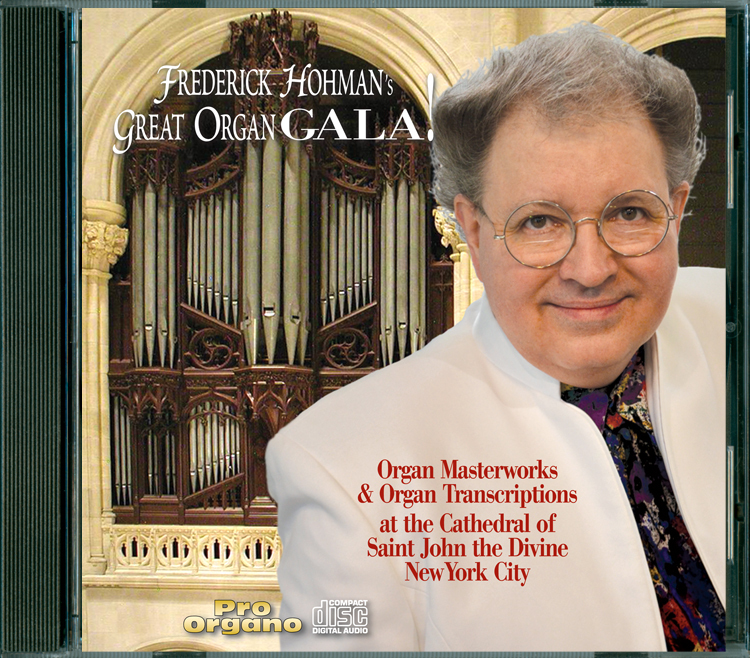 Frederick Hohman presents a program of standard concert organ repertoire and organ transcriptions upon the Great Organ of the Cathedral of St. John the Divine in New York City. Recorded in late October, 2015, the album was released on December 26, 2016. In addition to the CD program, one additional track is available at the ProOrgano.com website, of Hohman's organ transcription of Rachmaninoff's famous Vocalise. 78 minutes. MP3 Download ONLY - FREE! 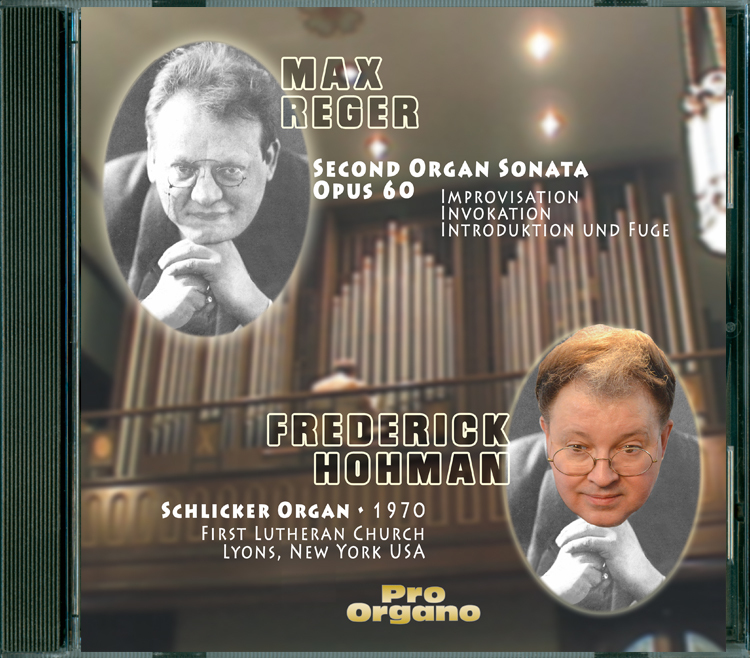 In this 24-minute miniature download release, recorded in 1979 and released in 2016 for the first time, Frederick Hohman plays the complete (3 movements) Second Organ Sonata, Opus 60, by German composer Max Reger upon the 1970 Schlicker Organ of First Lutheran Church of Lyons, New York. The MP3 download is absolutely FREE and is available to all at no cost. In this latest sequel to the original Lemare Affair CD, Frederick Hohman spotlights the original works and transcriptions that were created by Edwin H. Lemare during the 1920s, when he was serving as Municipal Organist to the City of Chattanooga, Tennessee. The program is performed upon the 1924, 4-manual Austin pipe organ in Soldiers and Sailors Memorial Auditorium in Chattanooga, the very organ upon which Lemare performed regularly, and which remains virtually unchanged from its original 1924 condition. The album was recorded on May 30, 2014. 73 minutes. In this 77-minute recording, organist Frederick Hohman presents a program of 12 of his favorite movements from the 10 Organ Symphonies of Charles-Marie Widor [1844-1937] upon the 1927 Casavant organ, recently revived by Schantz Organ Company in the sanctuary of St. Andrew’s Lutheran Church in Mahtomedi (greater Twin Cities), Minnesota USA. The 20-page booklet contains a 4000-word essay by Dr. Hohman about Widor and his music, as well as a brief history of the organ and the organ specification. 77 minutes. - DVD and CD set. This release contains a new video production, made in September 2008, on the occasion of Frederick's return to perform in concert at Methuen Memorial Music Hall, Methuen, Massachusetts (near Boston). The new video program - 67 minutes - features Hohman performing Bach, Vierne, Grieg and Widor, and an extended tour throughout the inner workings of the Great Organ at Methuen with organ technician Matthew Bellochio. The audio CD in the package is a re-issue of the 1995 CD "Forever Methuen" plus contains one new track which was recorded in 1995 but was not included on the original release. 87-minute DVD plus 79-minute audio CD. CD: USD $20. MP3 at iTunes. Link Here to Buy OnLine. This release was produced as a promotional CD for the Wicks Organ Company in May, 2006; however, nowhere on the CD are the organists identified! In 2009, it was revealed that the sole organist in this CD is none other than Frederick Hohman, the CD's producer! The featured organ is by Wicks, Opus 6419, at First Congregational Church in Kalamazoo, Michigan. This CD opens with "Iberian Feast of the Resurrection" composed under Fred's nom de plume, Carlos Xavier Santiago. The CD also has several special arrangements by Hohman, including an EXTENDED version of Widor's famous Toccata from the Fifth Organ Symphony, which one can find published by Zarex Scores. 69-minute audio CD. LEMARE AFFAIR III - Pro Organo CD 7117. Original Symphonic Organ Music and Organ Transcriptions by Edwin Henry Lemare, as performed by Frederick Hohman on the Mighty Kotzschmar Memorial Organ, Merrill Auditorium, Portland, Maine, City Hall USA. In this third volume devoted to the greatest organist of the 19th and 20th centuries, Edwin Henry Lemare, Frederick Hohman plays some of his more virtuosic as well as lyrical works and transcriptions. CD audio and MP3 - 72 minutes. SYMPHOHMANIA - Pro Organo CD 7077. In this 2001 recording, Frederick Hohman plays symphonic transcriptions of Lemare, as well as several of his own organ transcriptions, upon the Schoenstein organ at First-Plymouth Congregational Church, Lincoln, Nebraska. CD audio - 78 minutes. CD: USD $ 17.98 Link Here to Buy OnLine. OPUS 190 - Pro Organo CD 7042. In this 1995 recording, Frederick Hohman plays the oldest working 4-manual pipe organ built by Ernest M. Skinner, dating from 1910, and brought to live with restorative repairs by Quimby Pipe Organs, Warrensburg, Missouri, at the Grand Avenue Temple United Methodist Church in Kansas City, Missouri. CD audio - 75 minutes. MP3 at iTunes. CD: USD $ 10.00 - Link Here to Buy OnLine. A COUPLE OF FRENCH FIFTHS - Pro Organo CD 7021. In this 1992 recording, Frederick Hohman plays the complete Fifth Organ Symphony of Charles-Marie Widor (including the famous Toccata that has been viewed over 350,000 times at YouTube), and the complete Fifth Organ Symphony of Louis Vierne. The organ is the 153-rank Schantz Pipe Organ - an organ that Hohman re-dedicated at a gala concert in 1990 - of the Cathedral Basilica of the Sacred Heart in Newark, New Jersey. CD audio - 78 minutes. CD: USD $ 15.00 - Link Here to Buy OnLine. LEMARE AFFAIR II - Pro Organo CD 7018. Original Symphonic Organ Music and Organ Transcriptions by Edwin Henry Lemare and two of his contemporaries: William Wolstenholme and Alfred Hollins, as performed by Frederick Hohman on the Mighty Kotzschmar Memorial Organ, Merrill Auditorium, Portland, Maine, City Hall USA. In this sequel to the original LEMARE AFFAIR, Frederick Hohman plays the very organ that Lemare once played, when, during the 1920s, he was the Municipal Organist to the City of Portland, Maine. CD IN STOCK AGAIN! - 72 minutes. Link Here to Buy OnLine. LEMARE AFFAIR - Pro Organo CD 7007. Original Concert Organ Works by Edwin Henry Lemare, as performed by Frederick Hohman on the Aeolian-Skinner organ of the Church of the Epiphany, Washington, D.C. This is the CD that started it all: the symphonic organ revolution. CD audio and MP3 - 73 minutes. CD: USD $ 17.98. Link Here to Buy OnLine. THE ENGLISH CONNECTION - Pro Organo CD 7029. In this recording, organist Frederick Hohman plays the only tracker-action organ built in the USA by English organ-builder Noel Mander. Noel Mander’s work is carried on today by his son, John Mander. The organ case used for this historic site dates from 1741, and is installed in the sanctuary of the former Church of St. Mary Aldermanbury, as is now relocated on the campus of Westminster College in Fulton, Missouri. This album was originally produced by Frederick Hohman, a Fellow of the Churchill Memorial, in celebration of the 25th anniversary of the dedication of the Winston Churchill Memorial in Fulton in 1994. The program features tuneful music of English origins, alongside music of J. S. Bach and Felix Mendelssohn. CD audio - MP3 Album Download - 76 minutes. BY REQUEST - Pro Organo CD 7070. Frederick Hohman plays a program comprised of favorite organ pieces as indicated by the employees and administration of the Austin Organ Company, Hartford, Connecticut, on the Austin pipe organ located in the Austin family church, St. John’s Episcopal Church, West Hartford, Connecticut USA. CD audio - 68 minutes. THE NUTCRACKER - Pro Organo CD 7012. Frederick Hohman plays a program comprised of favorite organ pieces as indicated by the employees and administration of the Austin Organ Company, Hartford, Connecticut, on the Austin pipe organ located in the Austin family church, St. John’s Episcopal Church, West Hartford, Connecticut USA. MP3 DOWNLOAD ONLY - 75 minutes. Link Here to Buy OnLine.